The former site of the historic Tennyson Power Station on the Brisbane River at Tennyson in Brisbane’s south has been transformed over the last 5 years in to a new premium residential precinct and the Queensland Tennis Centre by developer Mirvac. 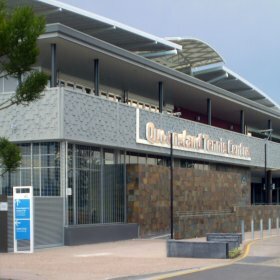 The new $82 million Queensland Tennis Centre was officially opened by the Premier of Qld, Anna Bligh MP on the 2nd January 2009 with the centrepiece being the 5,500 seat Pat Rafter Arena. 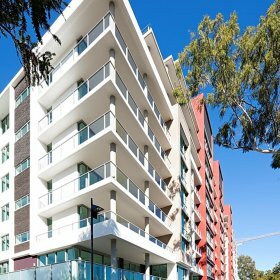 Adjoining the new State Tennis Centre is the new residential development, Tennyson Reach. Tennyson Reach has an approximate value of over $600 million and includes 390 luxury apartments in 6 buildings adjacent to the Brisbane River. Construction of Stages 1 has just been completed with Stage 2 to be completed early 2010. A new public riverfront parkland will also be delivered, the first stage in early 2010. 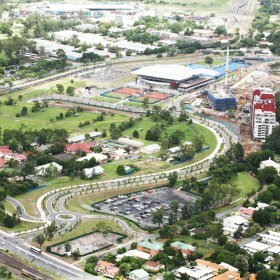 Lambert & Rehbein worked closely with both Mirvac and Brisbane City Council to successfully deliver the works in the particularly short time frame required to enable the inaugural Brisbane International, at the Queensland Tennis Centre in January 2009.